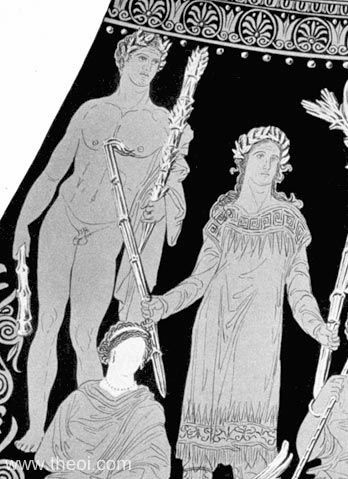 Side A: Detail of Iacchus and Hecate from a painting depicting the gods of the Eleusinian Mysteries. Other figures (not shown) include Demeter, Plutus, Persephone, Eros, Triptolemus, Heracles, Zeus and Nike. Iacchus is crowned with a wreath and holds a pair of torches in his hands--one upturned and one downturned. Hecate, standing between the enthroned goddesses Demeter and Persephone, holds a pair of flaming brands. Side B: The birth of Erichthonius (not shown).